Mexican Dresses - Handmade Masterpieces crafted by Mexican Indigenous Groups - Hand Embroidered dress "Primavera B"
White Mexican dress with hand embroidered multicolored embroidery accent. Loose construction for an airy feeling 100% Cotton, even the lace is made of cotton. Artisan made. <**Size**>: One size, fits comfortably US-Women Size 4-8 <**Flat Measurements**>> Bust 20 in. Length 36 in. PLEASE, CHOOSE the embroidery your like: 1, 2, 3, 4 or 5 Custom Orders are welcome. MADE IN: Oaxaca, México. Artisans: Q. Family. 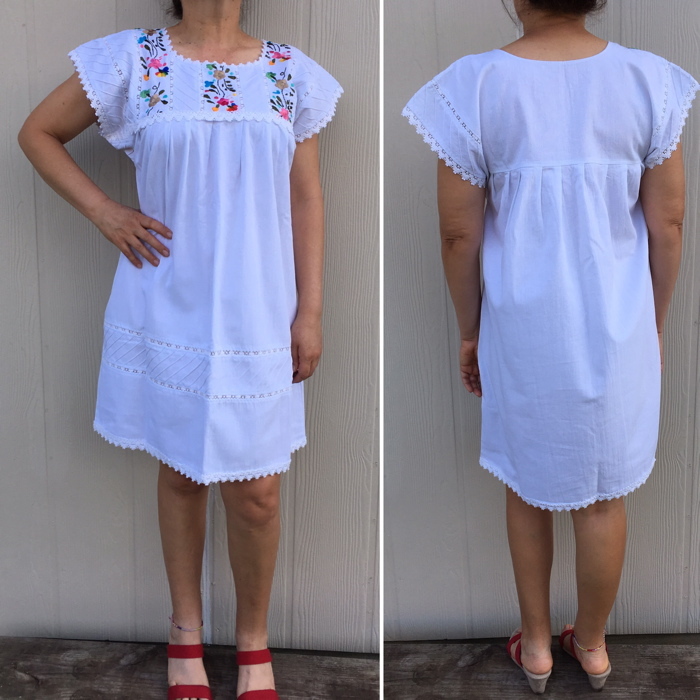 Currently viewing:Mexican Dresses - Handmade Masterpieces crafted by Mexican Indigenous Groups - Hand Embroidered dress "Primavera B"